Dr. Orville Ward Owen began his career in Detroit as a very talented young physician. Unfortunately, rather than golf, Owen passed his free time studying and memorizing the works of Shakespeare. After several years he developed something of an obsession with patterns, non-sequiturs and repeated lines he noticed in the plays. He came to the conclusion that Francis Bacon had written, and embedded secret messages within, Shakespeare's works. This was something of a growth industry in the 19th century; former Congressman and failed Vice Presidential nominee Ignatius Donnelly had recently published The Great Cryptogram on the subject, a follow-up to his previous top sellers Atlantis: The Antediluvian World and Ragnarok: The Age of Fire and Gravel (arguing that destruction of Atlantis and the Biblical Flood were both caused by a near-miss by a comet). One of Owen's first discoveries was a passage he took as instruction in how to pursue Bacon's secrets. She is our first guide. So he did. He chopped up copies of all of Shakespeare's works, along with selected works by Christopher Marlowe and several others (at least one of whom started writing years after Bacon's death), and stitched them to a 1000 foot long roll of linen, which he could roll backwards and forwards like a reel-to-reel cassette, as you can see in the photo. Owen's method reportedly involved finding certain keywords, which indicated that other nearby text was part of the secret message. He accumulated piles of the excerpts and then compiled them into a series of new documents, including plays, letters to future generations, and so forth. More importantly, he found an explanation for why Bacon wrote his works in the first place: he was the secret son of Queen Elizabeth, and the writings of Shakespeare (and the rest of the crowd) were his means of preserving in hidden form the truth. He published his findings in a series of books, with the primary one being the 5-volume set Sir Francis Bacon's Cipher Story, which he released in 1893.
the original 1623 portfolio of Shakespeare's plays contained an encrypted description of the defeat of James II's Armada in 1692 (misidentified by the journalist as the Spanish Armada), which Owen decrypted extemporaneously while the reporter watched. The last of these is particularly bizarre, but it was consistent with other claims. 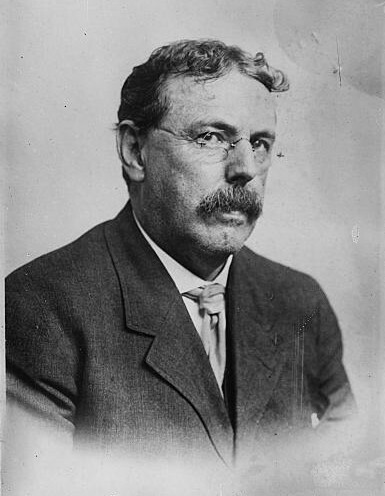 Frederick Wharton Mann, addressing the Witenagamote club in 1893, said Owen had "express[ed] the belief that Bacon possessed or had knowledge of the odic force. That he was endowed with a telepathic consciousness... whereby [he] had knowledge of events which were happening or had happened elsewhere." At various points Owen did claim that Bacon had predicted an individual named Owen would be the one to decode his writings, so there you go. Building on his work, Owen actually mounted an expedition to Wales in 1909 with the intention of recovering Bacon's original manuscripts of Shakespeare's plays. After spending over a year getting permissions from the British government and the local landowner, Owen set up excavations in the river Wye in Chepstow, at the site of a Roman bridge within which he believed Bacon had hidden his writings. The New York Times covered the dig throughout the spring of 1911, announcing such tidbits as Owen's declaration (later denied by him) that Bacon had killed and decapitated the historical Shakespeare, and that his head was expected to be hidden with the manuscripts. Several months into the dig, the New York Times published an overview of the operation, including a detailed example of Owen's decryption process which led to the identification of the supposed cache. Unfortunately, in December Owen returned to America empty-handed, apparently not returning except in 1913 to negotiate with a chimney sweep who fraudulently claimed to have information on the final resting place of Bacon's treasures. In later years, Owen is reputed to have extended his interests to Biblical prophecy, perhaps inspired by his conviction that Bacon has also been influential in the creation of the King James bible, one of the more plausible ideas imputed to him. But on top of all the recent reports of recent successes in aeronautics comes a statement from Dr. Orville Ward Owen, a prominent Detroit physician, who puts fort the belief that all the theories upon which past experiments have been based will eventually be cast aside as worthless. Dr. Owen proposes aplying in a new form a principle as old as the world - levitation by vibration. Through all the centuries birds and insects alone have possessed the ability to counteract the power of gravity. It is not alone the wings of a bird that enable it to remain in the air at will. There are birds that soar about without moving a wing, that rise and fall when traveling in the same direction as the wind, or in the teeth of a gale. How do they do this? By means of nerve vibration, according to Dr. Owen. Taking an ordinary bee, which flies at express train speed and carries thirty times its own weight, Dr. Owen rolled it in a plate of honey, and then watched the proceedings through a microscope, weeking to confirm his belief that the wings were agencies for propulsion rather than suspension, as commonly supposed. The first thing the bee did was to clean its legs and wings as carefully as possible. After this it settled back in the sticky mass and began to buzz. The sound grew louder and louder until a certain pitch, a certain degree of vibration, had been attained. Then the bee sailed off into space as though nothing unusual had happened. Was it the wings which made the flight possible? Dr. Owen affirms assuredly not. There was scarcely any evidence of their being used. Vibration was the magic influence that lifted the insect out of the honey and enabled it to make an escape that seemed impossible. In the course of his experiments looking toward the development of this mysterious power, Dr. Owen hit upon a gyroscopic top. Dr. Owen knew that vibration makes the sound which comes from a bell. Why not combine the top and bell, thereby providing a maximum vibration? The monorail has demonstrated the practicability, through spinning two gyroscopic tops, of lifting a car with freight and running it up on a single rail. The gyroscopic action is one of balancing power, not only permitting the lifting of heavy weights, but balancing them on one rail. In the aerial ship designed by Dr. Owen it is planned to have the tops within bells not only furnish the harmonic tones, or vibrations, but also acting as gyroscopes, keep the aerial ship or platform from toppling over and render it as stable in the air as if it were securely anchored on the earth. The weight one of these ships can lift will be dependent upon the size of the bells. According to Dr. Owen, twenty-two tons of sheet steel have been lifted and held in the air by a comparatively small top and bell. Whether Dr. Owen is right or wrong will presently be demonstrated, for a company has been formed to build an airship incorporating his ideas. Sadly, we of Mythic Detroit have not yet turned up details of this supposed business, or even more importantly the airship Owen designed, but further researches may always turn up a new discovery on this front. According to the brief obituary published in the New York Times, Owen passed away on March 31, 1924, after spending the last 6 years homebound due to paralysis. Interestingly, the obituary claimed that his daughter Mrs. Harvey Stewart was going to carry on his work, but research has yet to turn up any sign of her. However, his protege Elizabeth Wells Gallup did carry on, taking the Baconian research to Col. George Fabyan's Riverbank Labs in Chicago, which eventually birthed the US government's World War II cryptanalysis effort. 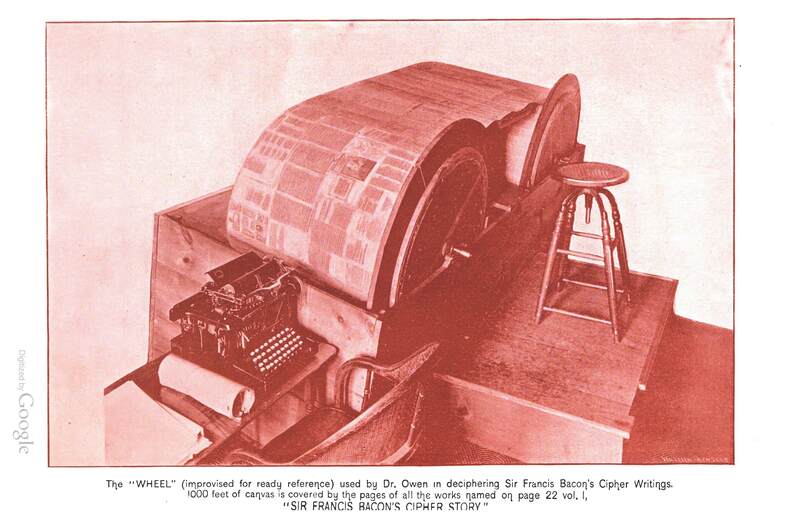 Fabyan also took ownership of the Cipher Wheel from the liquidation of the Howard Moore Publishing Company, which had specialized in publishing Owen's work and other Baconian materials until Moore's death in 1921. In addition to being used in further research at Riverbank Labs, the wheel was lent to Mrs. Pauline Holmes of Wellesley Hills, Massachusetts, who worked at extending Owen's research. 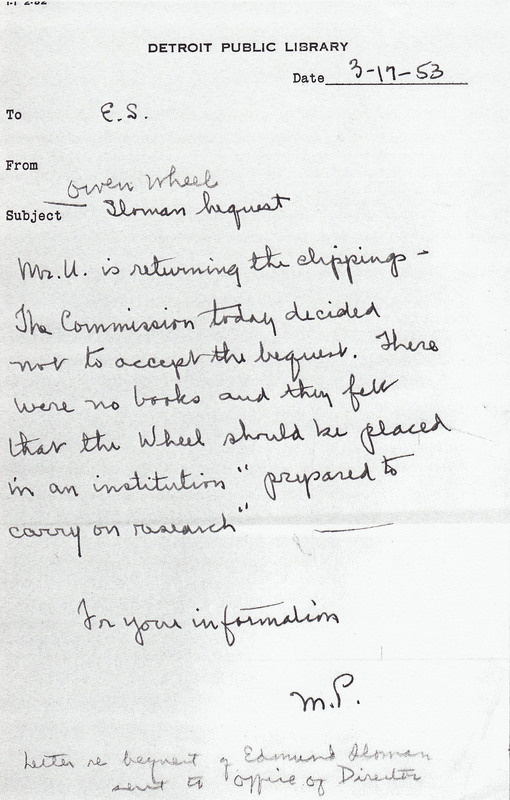 The wheel apparently returned to Detroit at some point, as The Burton Historical Collection at the Detroit Public Library has a copy of a memo from 1953 indicating that Edmund Sloman, who had been Owen's attorney, bequeathed the Cipher Wheel to the library. Sadly, the bequest was declined, with the commission declaring the Wheel should be placed in an institution "prepared to carry on research"; apparently that institution was a warehouse only rediscovered in the first decade of the 21st century. Now, the experts have pretty much written off Owen's Baconian writings as the literary equivalent of a mirage; cryptologically speaking his techniques were apparently garbage. But why let that get in the way of speculation? Among other things, Bacon was such a polymath that he could well have hidden any number of other secrets in Shakespeare's works. For example, another bit of knowledge Bacon was alleged to have embedded in his plays was a description of a Rosicrucian levitation machine (see Iona Miller's photo of an attempted reconstruction). While its discovery has been attributed to Owen's protégé Elizabeth Wells Gallup, it's just as likely Owen turned it up, given his bizarre flight theories. But, assume for the moment that Bacon was not the genius behind Owen's airship, but that it was Owen himself. A mind capable of decoding the mysteries of 400 year old cryptography and devising a novel theory of flight could be capable of any innovation. Perhaps he was the true genius behind the automotive revolution? Ok, probably not, but this interpretation of Owen might at least have swapped ideas with Ford and Edison when they periodically got together to hang out. Another interesting note is that Owen wrote a 6th volume of the Cipher Story, which wound up in the possession of Col. Fabyan, and appears to have remained unpublished to this day. There's always the possibility that the Baconian flight theories, or any number of other discoveries and secrets could be hidden within it. Finally, if Owen's daughter did carry on his researches, who knows what his descendants are up to today? Virginia Fellows actually tracked down the cipher wheel in the early 21st century and wrote a book on Owen's discoveries called The Shakespeare Code'. Sadly she passed away in 2006, but she published some great photos of people unpacking the wheel on the book's website. As noted above, the New York Times kept tabs on him for several years. Also noted above, The Burton Historical Collection at the Detroit Public Library has a biographical folder on Owen, as they do for many figures from the city's history; a biographical sketch apparently drafted for the folder gave the details of the Wheel's travels, and quoted a Detroit Free Press obituary on his biblical investigations. The quote from Frederick Wharton Mann came from "The Owen cipher: a paper read before the Witenagemote on Friday evening, December 1, 1893 (Witenagemote Paper No. 6)", available at the Detroit Public Library. Finally, Mythkateer Evert Huisman has dug up a wide range of historical newspaper articles on Google Books.